1. Preheat the oven to 190°C, gas mark 5. Line a 34cm x 24cm tin with baking parchment. Melt the butter and chocolate in a saucepan. Stir in the salt and sugar. Set aside to cool down, then mix in the eggs and vanilla. 2. Sift together the flour, baking powder and cocoa powder and make a well in the centre. Gradually add the melted chocolate mixture and stir in with a wooden spoon until just combined – being careful not to overwork the mixture. Stir in the fudge chunks. 3. Tip into the prepared tin and bake for 12-15 minutes, until the sides are cooked but the centre still has a little wobble. Set aside to cool, then keep in the fridge until needed. 4. 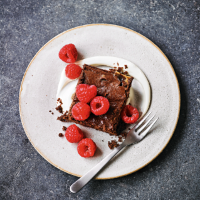 Serve straight from the fridge, cut into 12 squares, with a little crème fraîche, some raspberries and a dusting of icing sugar. Cook’s tipThese keep in the fridge in an airtight container for 3 days. This recipe was first published in July 2018.